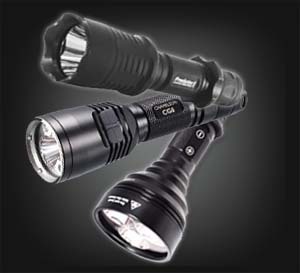 Nitecore flashlights are a popular choice among hunters who benefit from multicolor LED options and long throw beams. We've assembled a collection of Nitecore flashlights and kits that make the perfect hunting light. Nitecore flashlights like those in the Chameleon Series are equipped with auxiliary color LEDs making them versatile enough to take on the challenges of hunting. Track blood, scan for predators or light up the whole forest - Nitecore does it all. With nearly 700 yards of beam throw, lights like the MT40GT make it easy for hunters to find prey in the distance without spooking. Nitecore flashlights can also be fitted with a color filter to instantly transform into a hunting light. We've joined with our partner site to bring you Orion professional hunting lights. Designed specifically for predator and varmint hunting where red and green flashlights are a must-have, Orion predator lights are some of the brightest and farthest throwing hunting flashlights on the market.